After the Monday evening ski of Mount Bailey, I headed north to Willamette Pass to car camp in a Sno-Park, planning to wake up early and drive to Pioneer Gulch on the west side of Diamond Peak to ski the SW Face. However, exhaustion and lack of motivation again conspired against me, and I couldn't wake up at any reasonable hour to ski. So I decided to skip Diamond Peak and just drive up the Cascade Lakes Hwy to my next destination, the Three Sisters. Along the way, a quick hike to the top of 7057 ft Odell Butte Lookout brought fine panoramic views across the Oregon Cascades (the road is gated about 1 mile and 500 vft below the manned lookout). The afternoon and evening was spent taking photos and heading towards my eventual destination, the Pole Creek Trailhead SW of Sisters with a plan to ski the SE Ridge of Middle Sister the next day. I headed up the bare Pole Creek trail at 6:30am, after a very cold night where temps had reached 36F at 5300 ft. The morning remained chilly as I hiked 2 miles through the forest to the Soap Creek crossing and on to the Chambers Lakes trail. Snow patches began below 6000 ft with solid snow by 6200 ft, but I didn't start skinning until after the North Fork Squaw Creek crossing at 4 miles and 6400 ft. There I left the trail and skied directly up the left fork of the creek, which is the outlet stream from the Diller Glacier. I figured it would be a fun variation to ski up the Diller to access the SE Ridge, and I skinned up through the gap in the huge terminal moraine, across very dark ashy and rock strewn snow. A few short sections of bare moraine had to be skinned across in order to reach the main body of the Diller Glacier near 7600 ft. I skinned west up the smooth uncrevassed glacier (large seracs were visible far to the right) and then angled SW onto the toe of the SE Ridge at the big flat at 8200 ft. A NE wind had been building up as I skinned higher, and on the crest of the SE Ridge the winds were 20-30 mph with gusts to over 40. To minimize my exposure to the wind, I traversed left across numerous bare rocky areas interspersed with snow to reach the southerly aspects above the Irving Glacier and then skinned directly up to 9000 ft. Here the minor rock rib protecting me from the wind faded out and I was again exposed to the full blast. Although the day was sunny and beautiful, and the SE Ridge and South Face both had continuous skiable snow right to the summit, the biting cold wind made the thought of ascending another 1000 ft up the ridge unbearable. I just didn't want to suffer that much to reach a summit I'd already skied before, and the snow underfoot was still solidly frozen at 11:30am. I quickly converted and skied down the smooth frozen surface, which rapidly transformed by 8800 ft into some of the best corn snow I've skied yet this year. The superb conditions continued right down onto the flats of the Irving Glacier near 7400 ft.
From there, I traversed SE to the low point of the saddle between Middle and South Sisters (7350 ft) and skinned back up towards the Carver Glacier, which occupies a shallow trough just east of the North Ridge of South Sister. I figured that since I hadn't made the summit of Middle Sister, I might as well try to ski another nice glacier run after coming all the way out here. I followed the smooth crevasse-free slopes of the fairly inactive Carver Glacier, which is now separated by melting into upper and lower sections, up to a prominent rock outcrop at 8950 ft on the upper lobe. Along the way, I made a brief jaunt onto the west edge of the Prouty Glacier near 8600 ft just for fun and to get a nice view up and down this glacier (which I'd skied a year ago from the summit). There was skiable snow on the headwall above the Carver up to at least 9200 ft, but this was a bit rocky and bumpy looking while the slopes below 9000 ft held acres of smooth corn. I skied down just before 2pm on another fantastic snow surface, although somewhat softer than the earlier run. The NE aspect and NE wind had kept the snow on the Carver Glacier in fine shape to mid-afternoon, but below 7600 ft on the slope down to Camp Lake everything turned to deep sticky mush as expected. I skied past Camp Lake and back along the trail route to the Squaw Creek crossing at 6400 ft. I considered skiing farther down on the other side, but decided against it given the up-and-down traversing route of the trail and the prospect of a maximum of 200 more vft. So the skis went back on the pack for the long 4 miles of up-and-down trail back to the car by 5:30pm. It had been a really fantastic day despite not going for the summit of Middle Sister, with about 6000 vft of total ascent (18 miles distance) and 4200 vft of mostly superb skiing on three different glaciers in one of the most scenic and alpine locations in the entire Oregon Cascades. The Diller Glacier provides shorter and more direct access to the SE Ridge for those doing it as a day trip, while the Carver Glacier would make a fine side trip or evening ski run if camped at the standard spot at Camp Lake when doing the SE Ridge as an overnight trip. 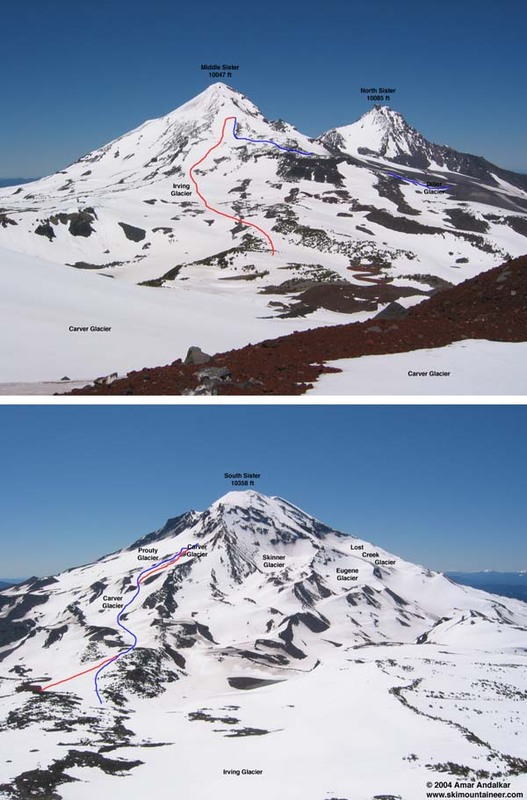 The upper photo shows Middle and North Sister as seen from the upper Carver Glacier on South Sister. The lower photo shows the north side of South Sister as seen from the SE Ridge of Middle Sister. Portions of my ascent route are shown in blue, with the ski descent shown in red where it differs from the ascent route. Click here for an enlarged version of this photo.